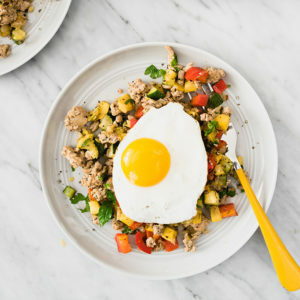 Savory turkey hash has quickly become my favorite breakfast meal prep of all time. It's ready in about 30 minutes, and is naturally paleo, whole 30 and gluten-free. Topped with a simple fried egg, it's a warm, filling and nutritious breakfast that's ready each morning in just under 5 minutes. 1 sweet onion diced to 1/2"
1 zucchini diced to 1/2"
1 yellow squash diced to 1/2"
1 bell pepper diced to 1/2"
Heat a 12" skillet over medium high heat. Add 1 tbsp avocado oil and heat until shimmering. Add the onion and saute, stirring frequently, until the onions are soft, 4-5 minutes. Add the garlic and saute until fragrant, 1 minute. Add the turkey to the onions and garlic, along with the herbs, red pepper flakes, and salt and pepper to taste. Saute, stirring frequently to break up the meat, until the turkey is no longer pink, 5-7 minutes. Push the turkey/onion mixture to the edges of the pan and add 1 tsp oil to the center of the pan. Add the zucchini and squash to the oil, and saute, stirring frequently, until the squash is tender but still retains a bite, about 5 minutes. Add the bell pepper to the pan and stir to combine all ingredients. Continue to saute the hash, stirring frequently, for an additional 3-4 minutes, or until the bell pepper is just barely cooked. Taste for seasoning and add additional salt and pepper if needed. Divide the hash between 4 plates and sprinkle with fresh parsley. Wipe out the pan, add the last two tsp avocado oil, and heat until shimmering. Crack four eggs into the pan, one at a time, and fry until the whites are set, 3-4 minutes. Top each plate of hash with a fried egg and serve immediately. For a meal prep version, divide the turkey hash into four single serving containers and store in the fridge for up to 5 days. When you're ready to eat, reheat on high for 1 minute, and top with a freshly fried egg.